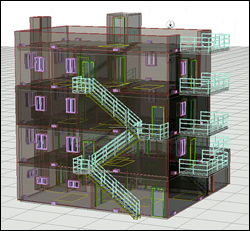 A rendering of a building at the Maryland Fire and Rescue Institute (MFRI) that was used for full-scale tests of the Cyber Physical System. Thanks to a combination of specialized software and sensors, researchers were able to observe fire, smoke and ventillation activity in the computer model, and at a safe distance, as a real fire moved through the structure. A Cyber Physical System (CPS) developed at the University of Maryland that shows first responders what a fire is doing before they ever enter a burning building has been highlighted by the Society of Fire Protection Engineers (SFPE). Department of Fire Protection Engineering (FPE) Associate Professor Andre Marshall and FPE graduate student Rosalie Wills (M.S. ’15), designed the system with support from Siemens Industry, Inc. and the SFPE Foundation’s Chief Donald J. Burns Memorial Research Grant, funded by Bentley Systems, Inc. The article explains how Marshall’s team used data from commercial sensors, data from Siemens' specially designed experimental sensor system, and Bentley’s 3D Building Information Modeling (BIM) software to visualize conditions in a full-scale experiment conducted at the Maryland Fire and Rescue Institute (MFRI). The model shows both an accurate representation of the building and dynamic fire activity within, including the temperature, size and location of the fire, carbon monoxide levels, ventilation conditions, and smoke layers. This realtime information allows firefighters to build a strategy, improve preparedness, and make decisions before entering the flames – including choosing not to if conditions are too dangerous. In addition to project management provided by Finnegan and Knoll, Service Account Engineer Kevin Kidwell of Siemens Industry, Inc., oversaw the installation of the sensor system. MFRI director Steve Edwards arranged for the use of MFRI’s facilities, and MFRI Industrial Training Specialist Martin LePore helped organize the live burn experiment. To learn more about the project, see “Development of a Cyber Physical System Test Bed for Fire Safety,” online at magazine.sfpe.org.